A lovely white luminous pattern lets the ivory lining show through on this short designer dress by Bailey Blue. As a day-to-night dress, this ivory-white short dress works well at the office, and instead of rushing home to change, you can wear this delightful cap-sleeve dress out for cocktail hour. 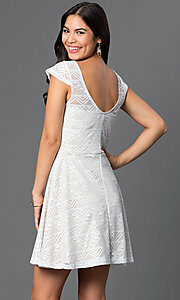 As a short graduation dress or rehearsal-dinner dress, it is an ideal choice. At an outdoor party in the summertime or even on the deck of a cruise ship, this versatile ivory-white dress will be a cherished go-to.